CONTROL AT THE HIGHEST LEVEL. They’re the three things that go through a rider’s mind when entering a fast bend out on the circuit – the SP and SP2 are so refined and precise, you’ll be swooping into them with much more confidence. Light, powerful and easy to control. 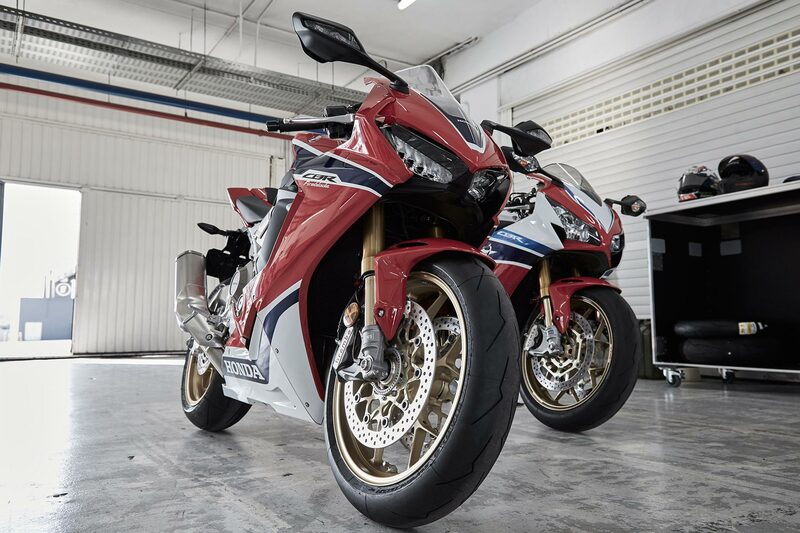 The 16 valve DOHC engine found in the CBR1000RR SP delivers class-leading power to weight ratio, making it stronger and lighter than its previous generation, while packing the latest technology derived from the groundbreaking Honda RC213V-S MotoGP™ machine. Powered by rich racing heritage and proven real world performance, the SP maintains its user-friendly character, specifically designed and dedicated to the concept of total control. Engineered with extraordinary precision and designed with powerful purpose, the high horsepower engine revs harder and higher thanks to its 13 : 1 compression ratio, advanced cam timing and high revving 13,000 rpm redline. The pistons feature an optimized wall thickness and crown design, while the piston rings have Diamond Like Carbon (DLC) coating that improves sealing. Polished inlet and exhaust ports in the cylinder head and “gas-flowed” combustion chambers improve efficiency, and the intake funnels are “slash cut”, a design used in World Superbike. From the use of a magnesium oil pan and ignition cover to a light Assist Slipper Clutch with light yet strong transmission gears, it all adds up to an engine that’s 2 kg (4.4 lbs) lighter than that found in its previous generation. This incredible attention to detail even included careful analysis on the precise shape and length of bolts, hoses and clamps. The titanium irregular-cross-section muffler helps shave overall weight, while also creating an unmistakable sound at wide open throttle. The exhaust supplier to the Repsol Honda MotoGP team was tasked to develop the prototype and produced an exquisite design with the 4-2-1 double-layer downpipes incorporating the exhaust valve within the first main pipe. The CBR1000RR SP features a cutting-edge electronic control system, allowing you to tailor its performance exactly the way you like it. Central to the system is the 5-axis Inertial Measurement Unit (IMU) gyro, which precisely measures what the machine is doing, in every plane. It works with the fuel-injection ECU, Throttle By Wire system—the first on an inline-four Honda—and even the ABS system to provide unparalleled ride control right at your fingertips. The Riding Mode Select System makes it easy to program the CBR’s electronic controls for various types of riding situations. Accessed via the instrument panel and switches beside the left handgrip, RMSS lets you choose, on the fly, between five different combinations of electronic control: three modes offer preset combinations of engine power level, rear-wheel traction and wheelie control, engine braking strength, and suspension damping control, while two additional user settings allow you to customize combinations to your exact preferences. Here’s what the Riding Mode Select System allows you to control. Power Selector (5 levels), which regulates engine power from peak output in all six gears at Level 1 to gentler power increase at Level 5 (all levels have the same throttle response on initial opening). Honda Selectable Torque Control (9 levels and off), which manages rear-wheel traction and front-wheel lift under acceleration. Selectable Engine Brake Control (3 levels), which regulates the amount of engine-braking force when you roll off the throttle. Öhlins Smart EC (3 manual and 3 automatic modes), which controls both the compression and rebound damping force of the semi-active Öhlins Electronic Control fork and shock. Working in conjunction with the Throttle By Wire, fuel-injection and ignition systems, the SP’s quickshifter and Downshift Assist let you smoothly and quickly upshift or downshift without using the clutch. It even momentarily blips the throttle on downshifts, and you can select from three modes or off. The CBR’s Dual-Stage Fuel Injection system features two sets of injectors per cylinder for instantaneous high-rpm response, great low-rpm fuel metering, and clean running. Refined EFI settings and larger throttle bodies (48 mm vs 46 mm) make the engine even more manageable, with smoother throttle response particularly at smaller throttle openings. Fully adjustable, semi-active, and track ready, the new Öhlins Smart EC suspension system is a huge upgrade from what you’d normally find on a streetbike. Here’s how it works: The Suspension Control Unit receives roll rate, yaw rate and lean angle information from the Inertial Measurement Unit (IMU) gyro, while also gathering wheel speed, engine rpm, brake input and throttle angle from other sensors. Using the Riding Mode Select System, you can choose from three automatic modes that calculate the ideal front and rear compression and rebound damping settings based on the input data, or use the three manual modes to set damping rates yourself to perfectly suit the conditions and your riding style. 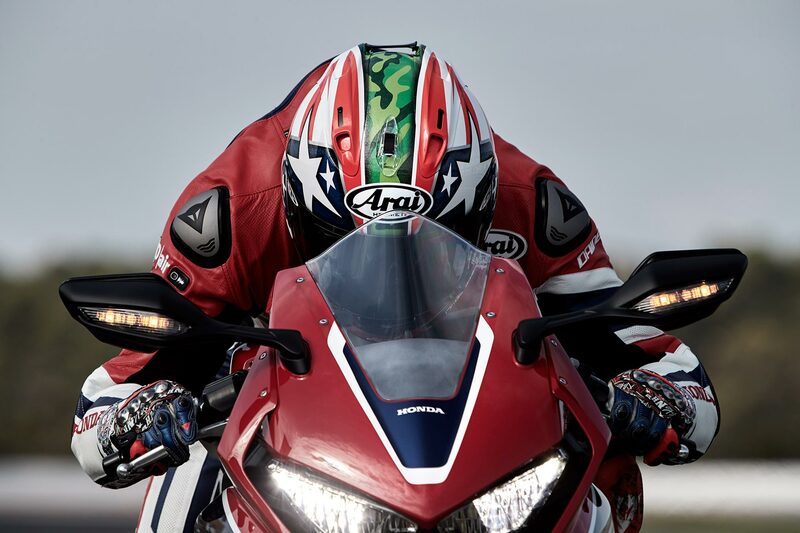 The CBR1000RR SP’s gyro-assisted ABS takes anti-lock braking technology to an even higher level. Using lean-angle data from the IMU and both front- and rear-wheel speed sensors, the system allows hard trail braking into corners and limits rear-wheel lift—preventing the rear of the machine from elevating or “backing in” around the front. Brembo four-piston monobloc radial-mount front brake calipers use newly developed brake pads with a high coefficient of friction that perform better at the elevated temperatures created during aggressive riding. The lightweight hollow die-cast twin-spar aluminum frame’s rigidity balance delivers precise handling with outstanding steering response, feel and stability. The Unit Pro-Link swingarm has also had the thickness of each section adjusted to save on weight, while maintaining transverse rigidity and increasing torsional rigidity. 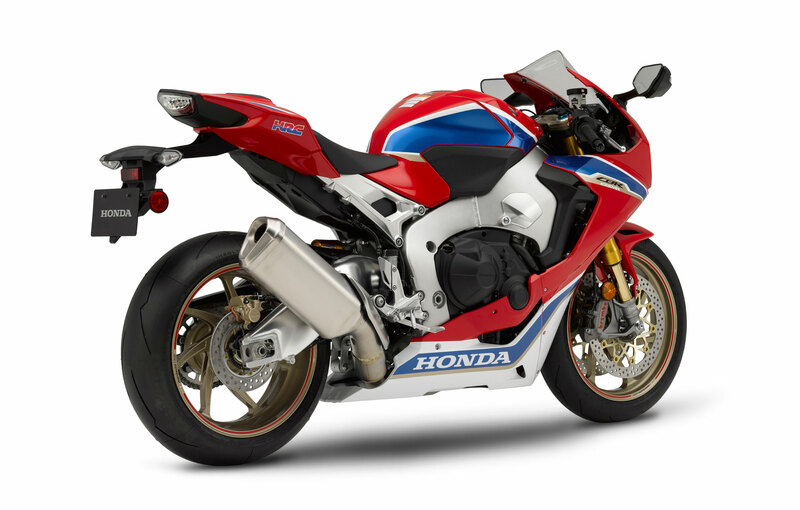 Honda has developed a compact 16-litre titanium fuel tank for the CBR1000RR SP. Manufactured by an ultra-deep drawing process, it’s 1.3 kg (2.86 lbs.) lighter than an equivalent steel tank and contributes to improved concentration of mass and a reduction in the moment of inertia. As well, knee-grip area is designed for improved aerodynamics and rider comfort and control. Most steering dampers only sense handlebar-deflection speed. The Honda Electronic Steering Damper (HESD) is way more sophisticated. It also detects vehicle speed, and adjusts damping proportionally. This helps maintain low-speed maneuverability while providing predictable high-speed handling. The lightweight Y-shape aluminum wheels offer aerodynamic stability and strength with an attractive supersport design. Like the exotic RC213V-S, the CBR1000RR SP uses a full-colour TFT liquid-crystal instrument panel that automatically adjusts to ambient light. It includes a speedometer, tachometer and odometers, plus indicators for gear position, shift-up point (rider adjustable), fuel economy, distance to empty, and more. And by choosing one of three modes—Street, Circuit or Mechanic—the panel also reveals a wealth of additional data. Street shows you the Riding Mode you’re in plus the settings for each parameter: P (Power Selector), T (Honda Selectable Torque Control), EB (Selectable Engine Brake) and S (Suspension). Circuit adds to these the lap time, number of laps, and difference from the best lap. Mechanic displays such info as grip angle, coolant temperature and battery voltage. 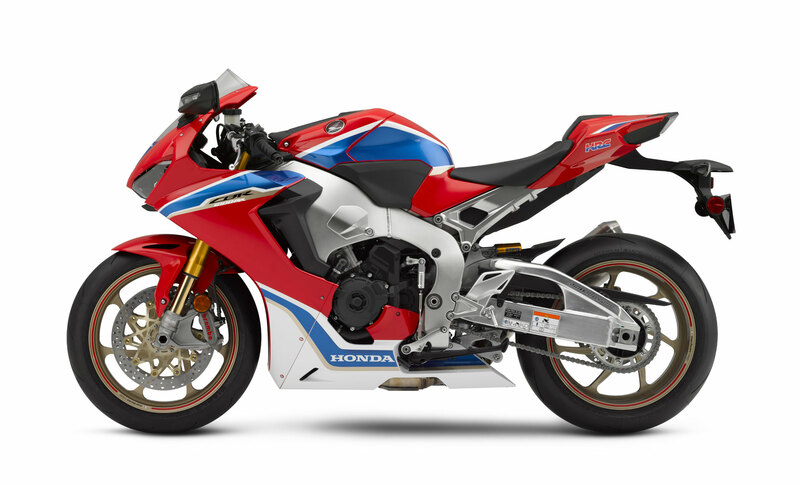 The CBR’s sleek, lightweight bodywork wraps around the chassis and engine tightly, adding to the bike’s compact proportions and aerodynamic efficiency. The narrow upper fairing and the surface angle of the headlights in conjunction with the contouring of the side slits all help support enhanced stability at high speed. In a racing crouch the rider is tucked well out of the airstream, and in normal riding situations air pressure is evenly distributed on the rider’s shoulders, back and sides. All lighting is crisp LED, with the twin front headlights offering high/low beam on both sides. The brilliantly bright headlights also further improve the CBR1000RR SP’s mass centralization due to their lightweight versus traditional headlight systems. The lithium-ion battery is half the weight of the previous lead-acid battery found in the previous generation. Service life is even better, and the central mounting location helps to improve mass centralization. Valve lift and timing are optimized for high engine speeds, with a peak of 13,000 rpm. Thickness of different areas of pistons are optimized for minimum weight, and compression ratio is 13.0:1. Piston rings have Diamond Like Carbon (DLC) coating for a superb sealing property. Air-intake duct and air box design minimizes air resistance. High fuel-discharge pressure promotes fuel atomization and maximizes combustion efficiency, while throttle response is maximized by intake funnels with a slash-cut design. Magnesium construction of the oil pan and ignition cover contribute to a low engine weight. Slipper clutch has a low clutch-spring load. Die-cast aluminum assist cams (transmitting & receiving) contribute to a low weight, while optimized clearance between the cams make for a good clutch-lever feel. On CB1000RR SP, lightweight titanium muffler helps concentrate mass. Its double pipe structure enables effective utilization of the expansion chamber, while the variable exhaust valve achieves a throaty sound and good power delivery across the rpm range. Derived from the RC213V-S, the Honda Selectable Torque Control (HSTC) measures front and rear wheel speeds and body roll angle, and also uses attitude-detection technology developed for ASIMO. Wheelie behavior is electronically mitigated during acceleration; based on wheel speeds, the ECU decreases the throttle-valve opening to reduce torque. The slip rate of the rear wheel is restrained during cornering and acceleration; torque is controlled based on vehicle roll angle, such as when turning, contributing to a sense of security during the riding experience. The rider can choose how strongly the engine brake is applied when the throttle is closed during deceleration; three levels of adjustability are available, depending on rider preference. A quick shifter allows shifting up or down without use of the throttle or clutch; the driving load on gears is reduced during shifting, simplifying the rider’s shifting process on the track, on winding roads or in traffic. For both upshifting and downshifting, feel can be adjusted between three levels. Adapted from the RC213V-S, the throttle-by-wire system (a first on a straight-four Honda) features a built-in Accelerator Position Sensor and improves response and rideability. Full-color thin-film-transistor liquid crystal meter features Street, Circuit, and Mechanic displays and is designed to not be intrusive for the rider. A five-level Power Selector enables on-the-fly adjustment of riding modes, HSTC and suspension electronics, adapting the machine to changing conditions. Lightweight lithium-ion battery helps centralize mass. Optimized frame-wall and swingarm-section thicknesses for light weight and appropriate flex characteristics. Wheels have five Y-spokes for aerodynamic stability, while thickness is minimized for low weight. Radiator has a high-density core that achieves high heat dissipation while allowing a narrow width and low weight. Minimalist, aggressive, aerodynamic design achieves narrow widths at front of fairings. World’s first titanium fuel tank for a mass-production road bike is manufactured using ultra-deep drawing process, achieving low weight and high mass centralization. 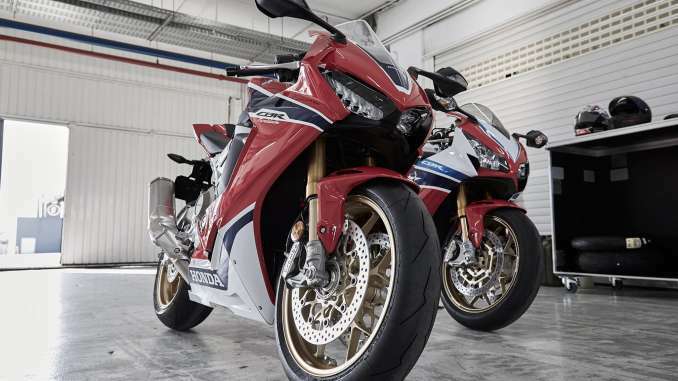 The CBR1000RR SP has semi-active Öhlins Electronic Control (EC) suspension, with 43mm NIX 30 EC fork and a TTX 36 EC shock. Settings are optimized electronically to suit the conditions. Standard version has Showa 43mm large-volume BPF inverted fork and Balance Free Rear Cushion (BFRC) shock. Available anti-lock braking system (ABS) features rear-lift control (RLC), for smooth, effective braking on corner entry; braking force is controlled according to lean angle, and hard trail braking is allowed. On standard version, highly rigid Tokico four-piston opposed radial-mounted front-brake calipers with high-friction brake pads provide strong stopping power. A full range of official Honda Accessories are available for this model, including Quick Shifter, Carbon Fiber Exhaust Protector and Rear Fender, Repsol Rear Tire Hugger, E-Cushion®Energy Seat, Accessory Socket, Grip Ends, Passenger Seat Cowl, and more. WARRANTY: Because we are so confident in the quality of each of our Honda Accessories, we are pleased to offer one of the best warranties in the industry. 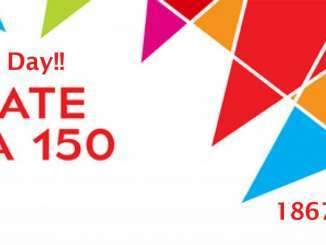 One-year warranty begins on the day accessories are purchased by the customer. Curb Weight* 430 lbs. 433 lbs. 431 lbs.